I admit, the title is a bit of hyperbole, but not by much. 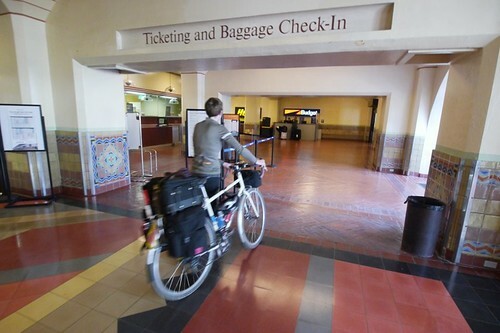 We’ve taken our bikes on Amtrak from LA Union Station several times for bike tours and take it for granted that we know how to navigate the Byzantine maze to do it. So as a public service, I took some photos to make it a little easier for other would be bike-train travelers. After a brisk ride from Sunland to North Hollywood, we took the Redline to Union Station. From the platform we made our way to the elevator (which fits two loaded bikes pretty well). You enter the grand and historic LA Union Station, where you can now get some coffee from Starbucks, a sandwich at Subway and other sundries at Famima! A Market. 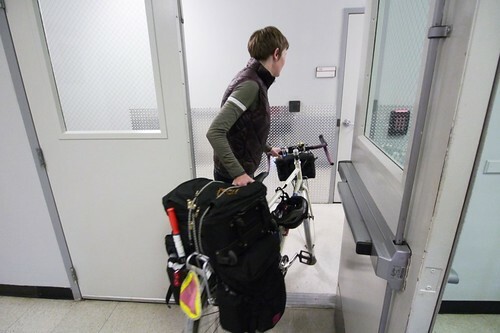 After getting your tickets either from the blue ticket machines or an Amtrak employee behind the glass, it’s time to find the hidden passage way to the luggage area to box your bike. If you are facing the Amtrak counter, go stage right. 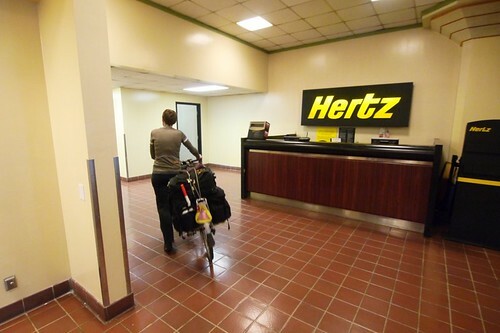 You’ll see the Hertz and Budget car rental stations. Walk towards them…. Then make an immediate left. 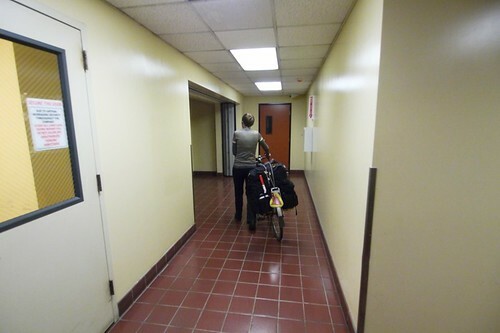 You’ll see a little yellow hallway and there will be elevators to your left which again accommodate two loaded bikes. Go to the second floor. When the elevators open you’ll be in a funny white room. Take the unmarked door to the left with the glass window. It should be open. 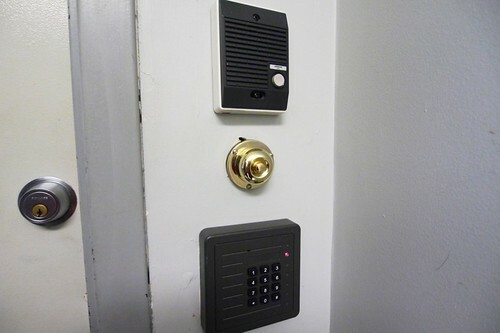 Now, proceed down the narrow hallway until you see a door with the magic brass button. Push it. A voice should tell you that the door is open. Enter. If you have cash on hand, then you’re done. If you have to pay for the bike box via credit card, the fun is not over yet. The baggage area doesn’t have a credit card machine, so you have to go back down to the Amtrak ticket counter and pay there….THEN, you have to back to the luggage area and show proof of payment. Congratulations, you’ve now successfully discovered the secrets of boxing your bike at LA Union Station. Now take all your bags back down through the maze and wait for your train. To be fair, the woman in the baggage area was very helpful and even taped our bike boxes together. This is a big improvement over several years ago when some people just stared at us with wonder. 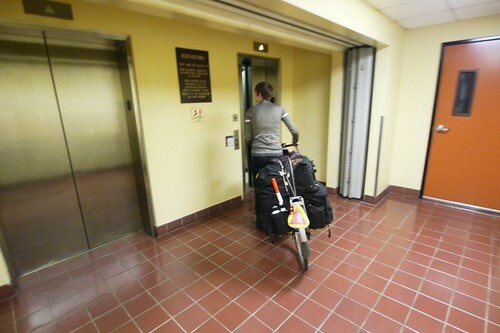 She told us that a lot of people were taking their bikes on Amtrak these days. It seems like others have caught on to the joys of multi-modal travel, now if only bike facilities on trains would catch up! 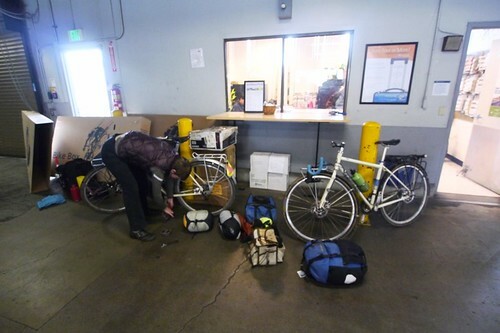 Thank you for taking the time and incredible amount of trouble to show us how to transport a bike on Amtrak. 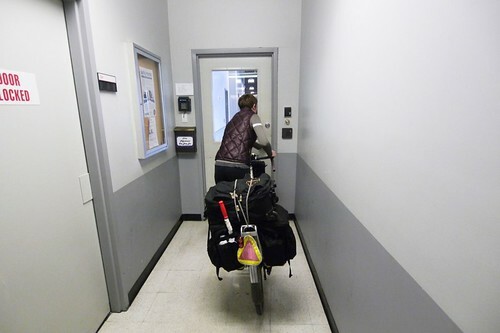 That there isn’t just a method to stow the bike in a cargo car with an ID tag. It seems like this is difficult at best, plus a $25 cardboard box fee. I really like rail journeys and being able to travel with a bike sounds great. I wonder, if a person used a Brompton or Dahon folder, would you have to jump through the same hoops? On some train lines, like the Pacific Surfliner, you don’t even have to pack your bike in a box. They either have a few vertical hooks per car or some sort of rack in the last car. I don’t think they’ll care if you bring a foldable aboard. Bromptons fold down even smaller than a Dahon (12″ vs 20″ wheels), might even be able to fit it in the overhead luggage rack. fyi – on Frontier Airlines it only cost me $20 to fly with my full sized bike. I got a box from a bike shop (free). Note – Don’t tape it up. TSA will cut it open and un-pack everything. Best to leave it un-taped, but packed. 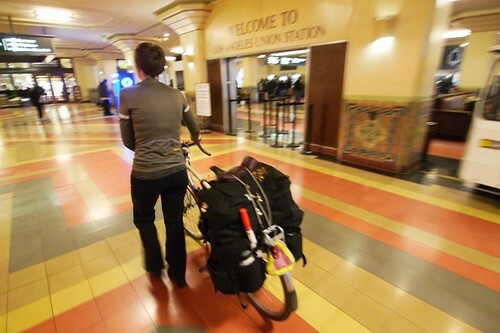 Also – When we rode from LA to SD we took amtrak back to Union Station. We just threw our bikes on one of the cargo trains (for free). Are those days over? So would it kill them to put up a sign or two to direct people to the baggage area? Or must you “acquire the knowledge” on your own like London cabbies in order to be admitted? Thanks for the guide. Great post! 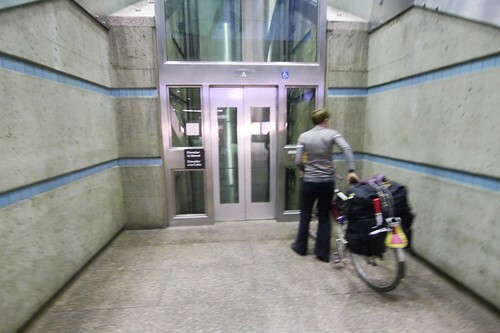 I’ve shipped a bike twice via Amtrak (without being on the train), and you go to the same place as shown in the photos. 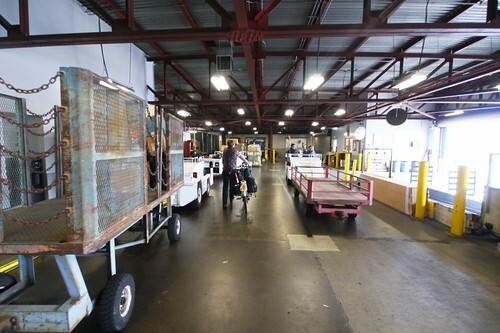 The only difference in my case was that I arrived by car (with the bike inside) and wasn’t buying any tickets, so I was able to drive up to the loading dock in order to get to the area in the last photo. thank you for this public service! it does not encourage me to travel on trains like that with anything other than a folding bike, though. geesh! Nice guide – had to do this twice myself, and the first time was quite bewildering at parts. Here’s an extra pro-tip: if you ask nicely, they’ll let you use their tape gun. 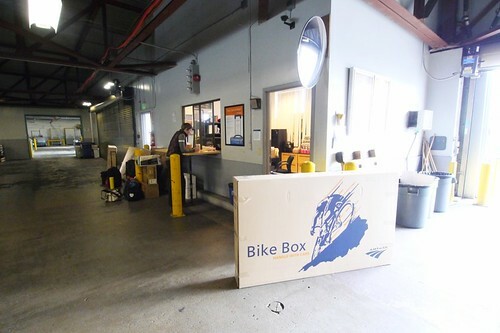 However, it is quite risky to try and buy a box from them to take your bike on the FlyAway to the airport…amtrak employees may decline to sell you a box if you tell them your plans, and the flyaway porter may only let you stow it if the bus is relatively empty. It’s probably too big for most airlines, anyway – though I took one on Air Tahiti Nui with no trouble at all. Funny thing is, after you have your ticket, you can ride out of the station to the North and right into their shipping area in back where that office you show is at. No gates, just ride right up. Its usually not very busy.